Find Cash Advance, Debt Consolidation and more at Chiip.org. Get the best of Insurance or Free Credit Report, browse our section on Cell Phones or learn about Life Insurance. 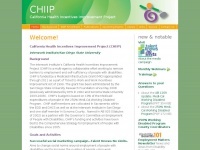 Chiip.org is the site for Cash Advance. The web server used by Chiip.org is run by GoDaddy.com, LLC and is located in Scottsdale, USA. There are many websites run by this web server. The operator uses this server for many hosting clients. In total there are at least 18,521 websites on this server. The language of these websites is mostly english. Only a few websites on this web server are x-rated. A Apache server hosts the websites of Chiip.org. XHTML 1.0 Transitional is used as markup language on the webpages. Indexing the data of the website and following hyperlinks on it is explicitly allowed by robot information.